Strive for the simple pleasure of finishing household tasks in no time with Elkay’s GE233212, a double-bowl sink encompassing the benefits of modernity with a style that will endure for generations. 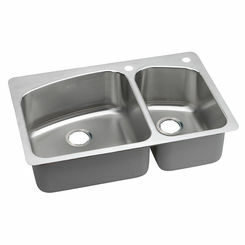 This rectangular sink is constructed of 300-type stainless steel that resists watermarks and scratches from everyday use. 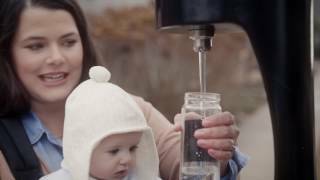 It’s the go-to choice for any family that wants a sink they can count on as years pass by. 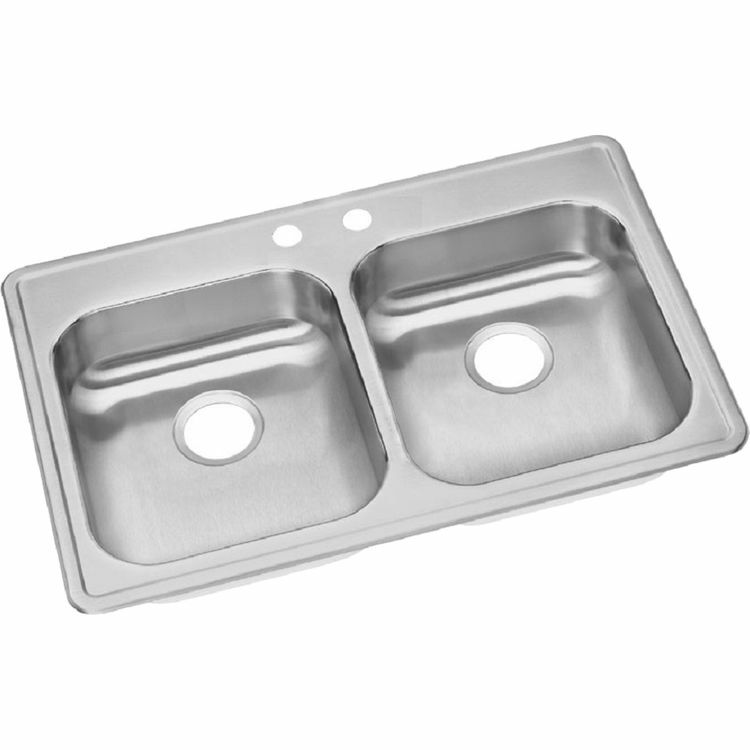 This sink is designed for drop-in installation and complies with ADA standards. 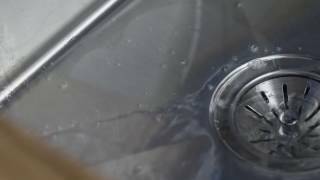 The Elkay GE233212 sink is from the Dayton Collection, designed for efficiency and functionality. 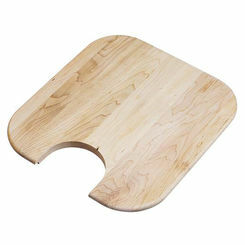 Its overall dimensions are 33" x 21-1/4" x 5-3/8" while the equal-sized bowls are 14" x 15-3/4" x 5-1/4". This sink has 2 faucet holes. The 3-1/2" drain openings are located at the rear center of each bowl (refer to the specification sheet). 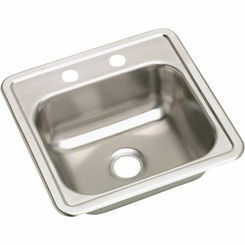 The exposed surfaces of this #22-gauge sink have been polished to a satin finish. 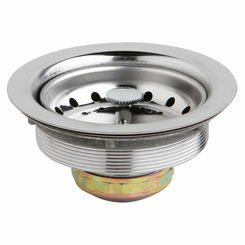 The bottoms of the bowls are padded for sound deadening and to prevent condensation. 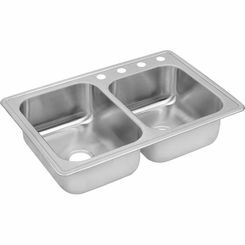 The Elkay GE233212 Dayton double-bowl sink is made in the USA and covered by Elkay's Limited Lifetime Warranty. 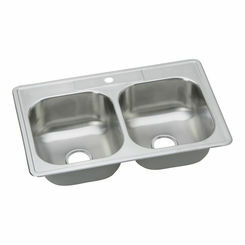 Break off from the monotony of your typical kitchen and get your sinks here at Plumbersstock.com! 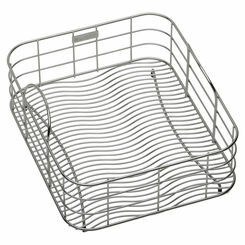 Shipping Dimensions 33.0" x 21.3" x 8.0"
Shipping Dimensional Weight 31.81 lbs. 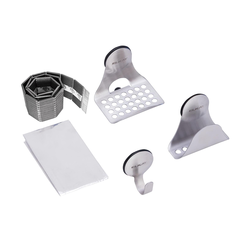 U-channel installation; mounting clips placed inside the channel before installation mean less time under the sink for an easier install.